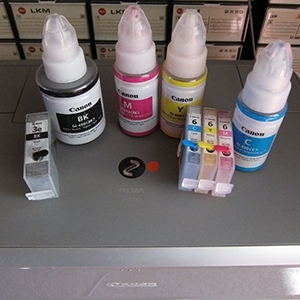 Discussion in 'Canon InkJet Printers' started by tjk, Jul 5, 2018. I've been fighting an issue with text/graphics alignment on my pro 100's and pro 10. I am trying to figure out what the non printable margins are on the device so I can set the setting in my software. I am trying to use the sample page here https://www.onlinelabels.com/printermargins.aspx and have turned off margins in my software and canon drivers, but I am getting different results across 4 pro 100's and my pro 10. Some show .125, some show .1875 and even .25 depending on how many times I print it. I've turned off scaling of the page/images/etc. I've got to be doing something wrong, but I just can't figure it out - yet. Any feedback or does anyone know what the non printable margins are set to, and are they fixed across all page sizes, like an 8.5 x 11, 13 x 19 or even 7 x 10? You must uninstall Pro-100 drivers and re-install the drivers. Canon Pro-100 is compatible for Windows and Mac. If want to recommend my friend website to download it below.